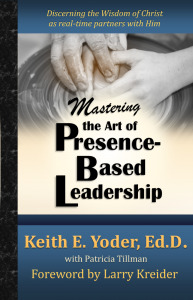 Mastering the Art of Presence-Based LeadershipLife-Affirming Resources by Loving & Caring, Inc.
By Keith Yoder. Presence-Based Leadership is becoming more and more vital in our unstable political and cultural environment. Not a program. Not a technique. Not another fad, but a posture for discerning the wisdom of Christ. Every leadership situation presents new and different challenges, but Christ knows every factor, every heart and motive, the present, past and future. How else can we dare lead but from discerning the wisdom and direction of Christ?